When I went to my front door to leave for work one morning, I was horrified to discover that I had left it unlocked all night! I checked my apartment to make sure nothing was missing – all was safe. Praise the Lord! Even more important that guarding our physical front door is guarding the spiritual door to our hearts. Just as I had a false sense of security in the mistaken belief that the deadbolt of my door was in place, sometimes I’ve been complacent in guarding my spiritual sphere of life. How dangerous! Have you ever judged someone else’s moral failure with the comment that “I’d never do something like that,” only to yield to the temptation yourself later? I must admit that I have. Such is the danger of pointing the finger at someone else – three other fingers are pointing back at yourself. I have always admired Dr. Bill Bright (the founder of Campus Crusade for Christ) and evangelist Billy Graham for the strong testimony of the integrity shown in their public and private lives. Both recognized the moral dangers confronting Christian leaders and took action to prevent them. 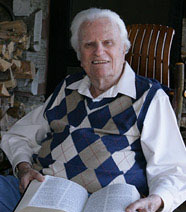 Billy Graham at age 95. Photo courtesy of Billy Graham Evangelistic Association. So in 1948, Billy called his team together with the goal of identifying the most common pitfalls and how to guard against them. Financial abuses. In order to avoid undue influence, shady appeals for money, and illegal misappropriations, they committed to integrity and openness in monetary matters. Sexual Indiscretions. Billy vowed never to be alone with a woman other than his wife and implemented other safe-guards as well. Unhealthy/unbiblical competition among faith organizations. Billy’s team modeled efforts to work with local churches wherever possible. Exaggeration. The temptation to inflate figures to satisfy pride was combated by a strong commitment to accurately report attendance and decisions. What are your greatest temptations? Identify the triggers or situations that pull you into these temptations. How can you avoid those situations? What Bible verses can you claim to overcome these challenges? Do you have someone you trust to become your accountability partner, who can keep confidences, is willing to warn you of danger, whom you can call when tempted, and will help you to recover when you fall?